Some time ago, I watched a silly superhero movie that had some surprising wisdom. Darkness, the truest darkness, is not the absence of light. It is the conviction that the light will never return. In my experience when I lose hope, when I stop believing that a better future is possible, I am surrounded by real darkness—like a cloud that never seems to want to leave. Then somehow a little spark of light appears, a singing bird, a sun ray, a smile from a stranger, a glass of water, a breath of fresh air. And there is space again, there is light again. There is hope. I am currently working on a project that focuses on hope, specifically for refugees in Greece who are in a desperate situation by providing them with employment and a supportive environment. An opportunity for them to breathe again, to get back on their own feet and to make a first step into a better life. This would have never been possible if it weren’t for two specific moments in time where I was surrounded by a lot of singing birds, fresh air, sun rays and smiles. This past autumn in Plum Village, the seeds of social action were given lots of water and space. One night, while walking back to my dormitory after a reading of the Discourse on the Eight Realisations of the Great Beings, I felt inspired and energised by having heard these words. The sixth realisation is the awareness that poverty creates hatred and anger, which creates vicious cycle of negative thoughts and activities. When practicing generosity, bodhisattvas consider every one, friends and enemies alike, as equal. After having worked in refugee camps for the past year and a half, I had seen this happen all around me. Young men and women transforming into angry shadows of themselves after weeks and months living in a hopeless situation. These words deepened my understanding and strengthened my conviction that this is something I wanted to do something about. That was the beginning of Not A Factory. After Plum Village, I joined a small group of practitioners who temporarily lived together in Athens while working in various organisations supporting refugees. This is what I had been dreaming of for a long time! 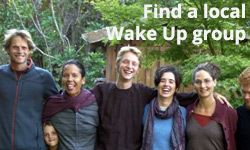 A group of people who practise and serve: The Greece Sangha Service Project. What more could I wish for! To work within these challenging conditions while being supported by a strong Sangha. Initially with some hesitation, I started to share about my dream of starting a project that would employ and empower refugees. I knew this was an ambitious dream with lots of complications and possible roadblocks. It’s something you don’t achieve in a day or on your own. But all my initial fears were washed away by the enthusiasm and support of the Sangha. Help was offered from every side. David with creative ideas, Dylan with legal advice, Dermot with pep talks and Mercia even came along and filmed the crowdfunding video with me. Each and every person contributed to make this project possible. I was not alone. They had my back. I slowly started to believe that this better future is possible. That there is hope. That we could start a light in the darkness. And be the light in the darkness. Step by step, the dream is becoming a reality. You can help make it possible here.